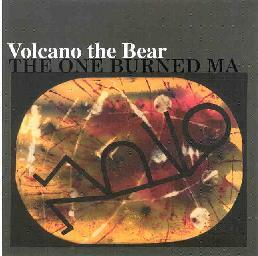 Volcano The Bear - "The One Burned Ma"
Volcano The Bear's first release on a US label consists of 4-track recordings made between March 1996 and February 2000. The band's Residents influences are even more apparent here than on last year's The Inhazer Decline, though aside from the scary mindfucking voicings the music itself belongs to VTB as they use a wider assortment of instruments than the synth loving Residents. Among the standout tracks is "The Colour Of My Mind", an atmospheric guitar and synth piece that just happens to include a succession of sounds that throw a wrench in the meditative works. Clanging objects and rushing water. Sort of like pots and pans flowing down a stream. Then a locomotive (I think it's a guitar?). In any event, this will turn upside down the traditional view of ambient music. "Digging For Opera" is similar though with more of a driving, slowly developing synth pattern. "She Sang A Song Of Norway" includes a simple synth melody and Frippoid loops that are accompanied by various creepy and freaky voices belting out this Nordic tale from the fiords. "Expert" has tribal percussion that sets the pace for a dark horn and string composition. The band's Faust and This Heat influences are apparent here and shows that the band can craft an appealing piece that combines bits of both chamber music and jazz. Robert Wyatt is a stated influence of the band and the vocals on "Wood Frong Pond" are Wyatt right on the mark. I remember a similar track on The Inhazer Decline. Of course VTB pays tribute to Wyatt in the same way the Residents tip their hats to The Beatles and Elvis. And "Arc Felt" seems to be VTB's idea of traditional Celtic music. Like the Chieftains after having been slipped a dose. The rest of the album features lots of freeform experimentations combined with a variety of wild vocals. I wondered whether VTB had gotten a bit carried away in that regard but after a few listens I guess the vocals don't really overwhelm the music. Overall, I'm not sure if I like The One Burned Ma more than The Inhazer Decline or not. I think either is as good a place to start though buyers in the US will certainly find this domestic release at a better price. Check them out. The adventurous will be rewarded. The One Burned Ma is distributed by Misra. You can visit their web site.